Also, we've included some free advertising coupons at the end of this guide to help get you started. The percentages account for the net gain or loss from the week. For more specific site data, and more historical numbers, you would want to get into the site's dashboard which we will cover in the next section. This initial account dashboard shows all the sites you have in your account and the associated metrics. The data is from a test site I created awhile back and kind of forgot about until they updated the tools over at Bing. A snapshot of all your sites in one place is a good way to immediately spot any recent issues with ranking, indexing, or crawling on your sites. Once you are ready to move on into a specific site, just click on the site name under the heading "Site". When you click the site's name, you'll be brought to the site's dashboard. For established sites with steady traffic (if for tracking ongoing campaigns) these 30 day snapshots are good ways for you to get a read on recent site activity and/or issues with traffic, crawling, indexing. These types of reports can also be very helpful to watch when you are doing site re-structuring or complete site overhauls (changing CMS, url structure, and so on). Each section has its own place within your site's webmaster tool profile. You can get more information on traffic, indexing, and crawling just by clicking the approriate link and we'll discuss each of these sections below. On this page the second chart listed is one that you can slide back and forth to shorten or lengthen the history of the data you are looking at. The lines are color coded to show overall impressions versus clicks. Bing does present the data in a clean and easy to understand way inside of their webmaster tool reports. This report is in conjunction with the first report of overall traffic/impressions from a time view. If you shorten the report this report will adjust as well. This is a good way to evaluate how you might be able to increase your CTR. By showing you impressions versus clicks (the average positions) you can guesstimate on which keywords could use a bit of freshening up on the title tag and meta description front. You can do the same thing here with average impression and average click position (and CTR) to evaluate pages which can use a refresh on title tags and meta descriptions for possible CTR upswings. Another tip here would be to export the queries and see if there is potential to build out the page's category further with content targeted to specific queries. 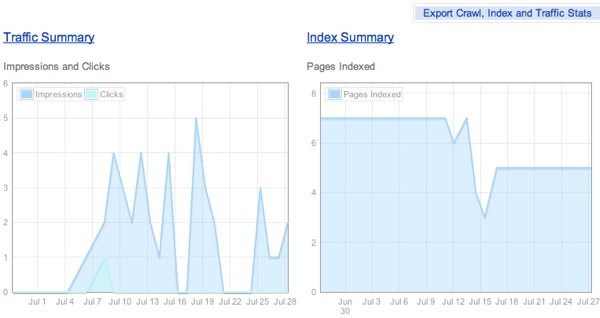 The index summary page shows the index rate of your selected site, in Bing, over (roughly) the last 6 months. The index summary chart is similar to the other charts in Bing's webmaster tools, which all the interactive sliding parameters that let you expand the report out over 6 months or drill down into a really tight, specific time frame. Bing's index explorer is a helpful tool that can alert you to HTTP code problems or confirm correct implementation of things like 301 directs. Using this in conjunction with internal link checking tools like Xenu Link Sleuth (win) or Integrity (mac) can really help you get a good peek into the potential on-page technical issues of your site. A couple of tools that give you valuable data about your on-page optimization are our Website Health Check tool (web based) and Screaming Frog's SEO Spider (mac/win). I hope Bing adds some export functionality here, as they do in other areas of their webmaster tools, but the filtering options are solid enough to drill down into key issues for now. So this is a pretty straightforward option. 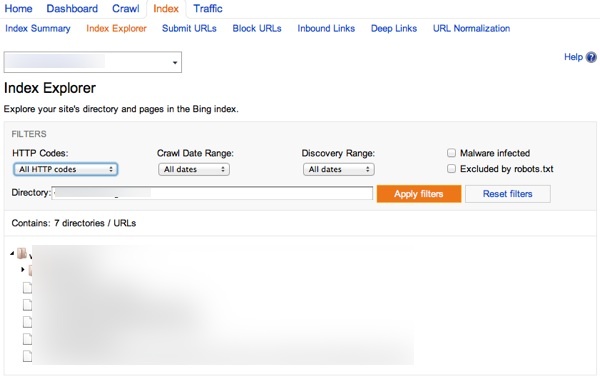 Bing gives you the option to submit URLs (can be ones that are or are not in their index now) that you would like to request a recrawl or an initial crawl on. The URL allowance is pretty limited so it's best to save these requests for more important pages on your site (their crawl section has a spot for sitemaps). One area for improvement here, I think, is to be able to input or upload individual pages. 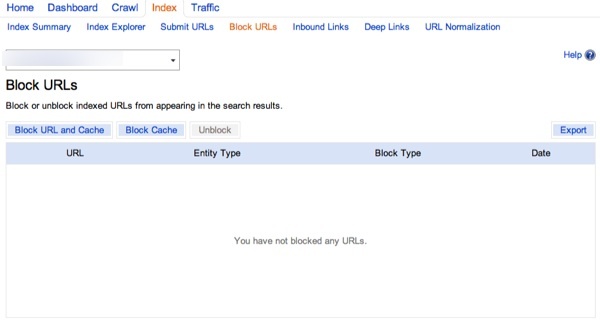 As of now, you can only input 1 page per click, or select a directory to block (site.com/directory/), or block the entire site. They do offer export functionality which is helpful when doing site audits, but a way to mass upload or input URLs would be nice (though you can tackle some of this with their URL normalization feature that will cover below). Bing will also show you the links they know about (in their index) that point to specific pages on your site. 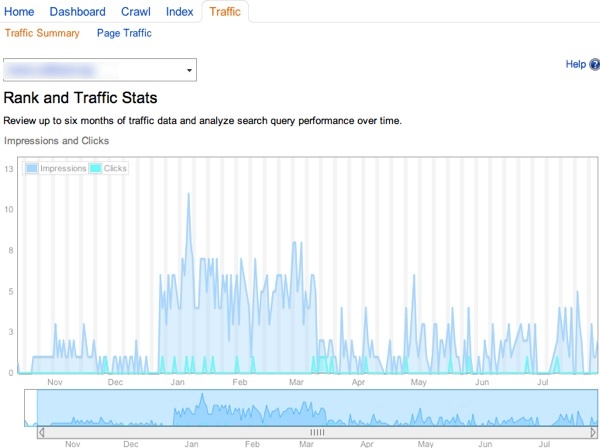 Much like the charts above, you are presented with a historical chart which you can adjust with the slider below it (just like the Rank and Traffic stats shown prior). Below those charts Bing will show you the pages on your site which have external inlinks and how many links they know of per page. You can export page-specific links as well as the overall breakdown of pages with links and how many links those pages have. The export functions offer a nice way to get a high-level view of the overall link depth of your site. Bing's Deep links are basically the same as Google Sitelinks. If you have been blessed by Bing, you'll see them in the Deep Links section of your site. These Deep Links are assigned to websites which are seen by Bing to be “authoritative” on the topic which they target. The best way to influence whether you are chosen to have Deep Links displayed for your website is to create unique, compelling content that pleases searchers. Sites receiving this feature do an excellent job of delivering what visitors want, and keep visitors coming back time and again. If your URLs encounter parameter issues that can lead to duplicate content (e-commerce sites, CMS functionality, etc) then you might want to take a look at Bing's URL normalization feature. This is a section where you need to be really careful as to not unintentionally boot out relevant URLs and content from the site. Combining this with use of the canonical tag (which Bing uses as a hint) is your best bet to ensure that there are as few duplicate content, link juice splitting issues on your site (with Bing). Again, make sure you or your programmer(s) know what you or they are doing so you do not do more harm than good. You can export all your inputted parameters as well. 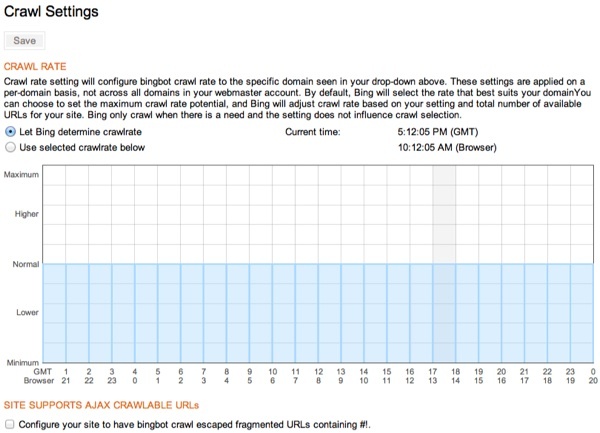 The Crawl Summary section shows similar charts to other category charts inside Bing's Webmaster Tools on the landing page (6 month charting with interactive timeframe filtering). You can use the timeframes given to line up with your server's location to make sure you are hitting the hours correctly (base time on the chart is GMT time). You can also allow for crawling of AJAX crawlable URLs if so you choose. They recently rolled this out and their help section is weak on this topic so it's unclear on exactly how they'll handle it (outside of #!) but it's an option nonetheless. 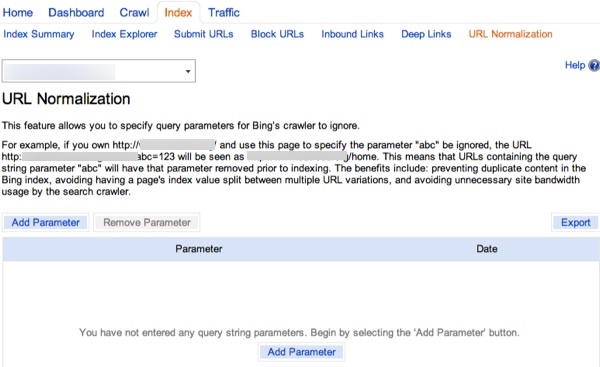 Bing's Crawl Details page gives you an updated overview of what's covered in the Crawl Summary. This feature doesn't require you to do any filtering to find issues, you can simply see if any of your pages have notable HTTP information, might be infected with Malware, and which ones are excluded by robots.txt. If you have any pages pop up, just click on the corresponding link to the left and a list of exportable pages will pop up. Another helpful, exportable report for site auditing purposes. For a site that's going to be a fairly static site (like this one) I'd pay more attention to proper site architecture rather than relying on a sitemap, I might even skip the sitemap unless I was using Wordpress where you could just have it auto-generate and update with new posts and such. You can add, remove, and resubmit site maps as well as see the last date crawled, last date submitted, and URLs submitted. 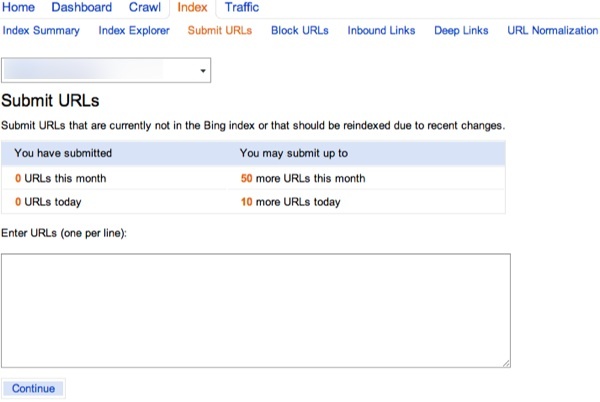 Bing's recent update to their Webmaster Tools added a good amount of value to their reporting. Here are some additional resources to help you get acquainted to Bing. Bing is currently taking weeks to months to index sites submitted. It is a also a waste of time since Bing will send you very little traffic compared to G or Y. Are you aware that Bing powers Yahoo in most major markets thai100? While Bing/Yahoo trails Google in market share there are a number of sites that do well with Bing. To ignore a search engine that accounts for about 30% of the market share (in the US) isn't really a wise idea IMO. Bing offers tools (see Microsoft Ad Intelligence) which give you search traffic right from Bing, so you can see which keywords actually get traffic in Bing before starting a campaign. Saying Bing is a waste of time in comparison to G is short-sighted, saying Bing is a waste of time compared to Yahoo shows a lack of understanding. In other markets/countries the swing is not as great but here in the US Bing has value.